This publication is an invaluable resource for employers, professional associations, trade unions, human resources professionals and others who are involved in hiring staff. 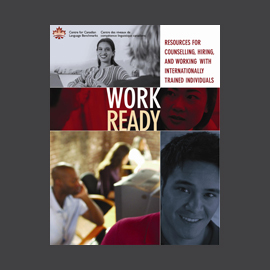 Many occupations require employees with strong skill sets and often recent immigrants to Canada have the required skills but may lack the language skills necessary to integrate successfully into the workplace. As the need to fill vacancies in the workplace increases, more and more attention is being focused on the means by which these highly skilled, internationally-educated workers can access suitable employment and help to reduce the labour shortfalls that are looming in many professions and trades. 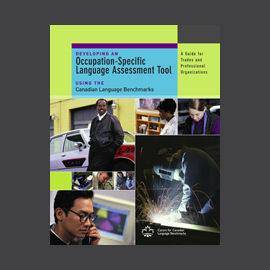 The manual provides guidelines and a framework for organizations interested in developing occupation-specific language assessment tools for professions and trades based on the Canadian Language Benchmarks. The publication addresses issues related to the recognition of the English language proficiency of highly skilled, internationally-educated professionals working, or seeking work, in Canada. It is based on the model used to develop the new nursing-specific language assessment tool, Canadian English Language Benchmarks for Nurses (CELBAN) (visit www.celban.org). The document describes the process by which professional bodies can be involved in the process of developing language assessment tools and provides actual information from the nursing project.